1999-02-09. New. Ships with Tracking Number! INTERNATIONAL WORLDWIDE Shipping available. Buy with confidence, excellent customer service! Naval Institute Press. Hardcover. 1557508100 New Condition *** Right Off the Shelf | Ships within 2 Business Days ~~~ Customer Service Is Our Top Priority! - Thank you for LOOKING :-) . New. Naval Institute Press, 1999-04-01. 1st. Hardcover. Used:Good. Naval Institute Press. Hardcover. 1557508100 New Condition. . New. 1999-02-09. Good. Ships with Tracking Number! INTERNATIONAL WORLDWIDE Shipping available. May not contain Access Codes or Supplements. May be ex-library. Shipping & Handling by region. Buy with confidence, excellent customer service! Naval Institute Press. Hardcover. 1557508100 Like New Condition. . Fine. US Naval Institute Press. Very Good in Very Good dust jacket. 1999. Hardcover. 1557508100 . Dustjacket has edgewear. ; 9.25" tall; 301 pages . Annapolis, MD: Naval Institute Press, 1999. First Edition. Hardcover. Fine/Fine. Hardcover in dust jacket. Second printing of first edition. Book and unclipped dust jacket are in fine condition, crisp and clean, with tight binding and sharp corners. Historic photos and diagrams throughout about the 1989 explosion that killed 47 Navy crewmen on board the battleship Iowa. 8vo. 301 pp. including index. In protective Mylar. US Naval Institute Press, 1999-04. Hardcover. Good. Excellent customer service. Prompt Customer Service. Naval Institute Press, 1999. Hardcover. Good Condition/Good. 301 pages. Ex-library with typical marks, light discoloring and wear; very good otherwise. The jacket has light creasing and wear. Quantity Available: 1. Shipped Weight: Standard Weight. 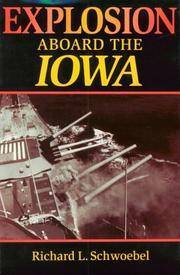 Category: Ships & the Sea; ISBN: 1557508100. ISBN/EAN: 9781557508102. Inventory No: 160095. . Naval Institute Press, 1999 Hardcover. Very Good/Very Good.